a positive impact on their lives. Check out the winning entries below. Farts, snores, laughter, simple smiles. These are just some of the simple little things about someone that you wouldn’t recognise or even spare a second glance to. But when you start missing that someone, it’s those little things that will make you miss the person more. 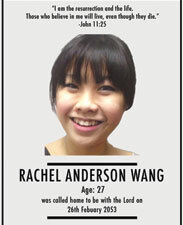 By playing with a mock-up of an obituary ad and combining witty copywriting of the little things about the deceased, this will in turn help to attract and keep readers intrigued. It’s a heart-warming obituary to celebrate the little things about a person and will definitely leave a smile to the readers. No mourning is needed. The idea behind my concept is to portray death as a ’rebirth’ to the Heaven. 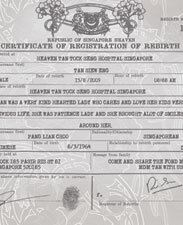 I designed this using our very own Singapore’s birth certificate with an added touch of the vintage European Art Nouveau elements. I feel that death in reality is a rebirth and it should be a joyous and memorable event, just like the birth of a newborn baby. I believe that life will be as beautiful and wonderful in heaven even after death. The message behind this ad is to inspire and give hope to people to allow them to see the issue of death in a different light. 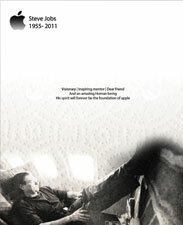 The idea is to create the ad from the perspective of the deceased whereby he writes his own obituary. The crane is used because it is believed to bring luck to people; hence, it serves as a symbol for the deceased’s conviction in giving back to the world. The viewer is left to ponder upon his deed while his legacy is laid down. 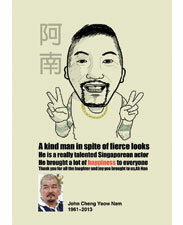 John Cheng, famously known as Ah Nan, was a rather famous getai veteran as well as a popular thug character in movies by Jack Neo and sometimes in the Channel 8 local dramas. He died of an apparent heart attack last month. The reason I chose to do an obituary for Ah Nan is because I watched a lot of his movies since I was a child, and he is one of the most funny Singaporean actors I have ever seen. The concept of this design is to make him look funny. 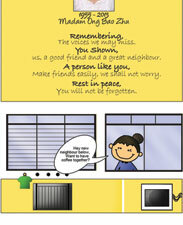 Because he had a typical "bad guy" look, I Illustrated a comic version of Ah Nan to make the obituary look cute and funny, and not so depressing. The idea is to capture a woman’s beauty and her grace, transcended through her years alive. This is for my mother, and I aim to capture her beauty through the image of her face created using rose petals. The light rose petals highlight the light features of her face and vice versa. Simply put, her role as my protector and mother motivates me to pursue arts, and I am just a younger representation of her. The England Style of Arts and Craft is used in the design, with repeated flowery patterns and borders. The idea is to capture a woman’s beauty and her grace, transcended through her years alive. 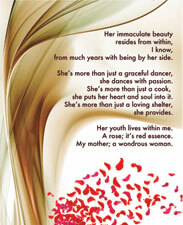 This is for my mother, and I aim to capture her beauty through the image of her face created using rose petals. The light rose petals highlight the light features of her face and vice versa. Simply put, her role as my protector and mother motivates me to pursue arts, and I am just a younger representation of her. The design for the obituary that I made follows the International Typography System or Swiss Design that emphasises cleanliness, readability and objectivity. That is why I’m using American Typewriter as the basic font, as it allows us to read clearly and is also eye-catching. I used more white space to evoke the feeling of sadness and yet bring out a sense of calmness. The use of the colour red is to attract people and represent the bravery of Kurt Cobain. 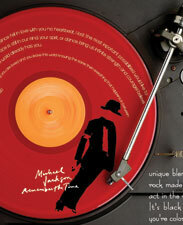 He was a legend and also a hero in the musical industry. Although he passed away in a tragic way, but he was well known through the generations as one of the founders of Grunge. 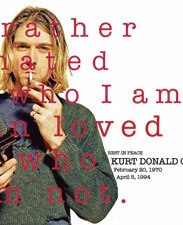 Rest in peace, Kurt Donald Cobain. This obituary is inspired by my grandma’s cooking. She liked cooking so much. I learned a lot of things from her. She made people happy with her cuisine. Every Chinese New Year, our family would gather at her house and eat together. That is the best memory I have of her. She died in 2007 at the age of 74, due to complications. My Grandmother was our best chef at home. She used to cook for the whole family, and I cannot forget how she used to be in the kitchen for almost a whole day and the smell of her freshly-baked cake. She always cooked my favourite food. 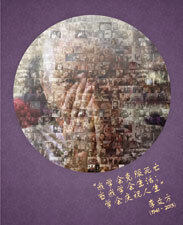 Every chinese new year, we used to gather as a big family and all of the food would be home-cooked by my Grandmother. Even though I cannot taste her cooking again, I will always remember her when I think about the taste from the good old times. It is the best memory of my childhood. 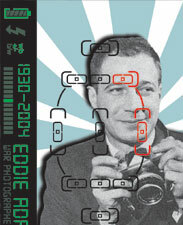 I am redesigning one of the most famous war photographers, Eddie Adams’s obituary (12 June 1930 - 18 September 2004). He is a photo-journalist who witnessed, recorded and changed history itself during the Civil War of Vietnam with his most knowing work, "The Unlikely Weapon". 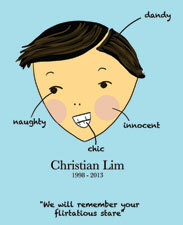 It inspired me to design his obituary in art deco style. I added a few elements in order to bring back the 90s feel. For example, the film grain effect on his image creates an old touchy feel. 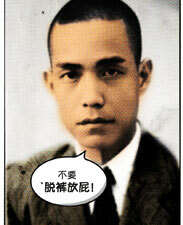 Since he was a photo-journalist, his portrait was designed in a modern DSLR viewfinder look. I have also chose the international typographic style (Swiss Design) for the font of his name, and the years to be in a digital typeface, and I intentionally portrayed him in a digital look to show that he is still being remembered till this day. All those stories and photos he had taken, they left an impression and are an inspiration to the modern world. People will always like to have the kind of "eye" for the moment like what Eddie had. The overall reason for the design of vintage and modern digital portrait for Eddie Adams is to enhance the picture by sending a message: Though he had already left us, his name will be engraved in the hearts of many for reminding what humanity really means. Reminisce your love in a different way. Through this platform, we can somehow know the deceased in one glance. 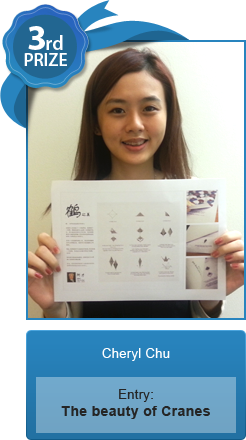 Testimonials from their loved ones will be asked for and put up. The testimonials will be a Mystery and let one know more about the deceased. 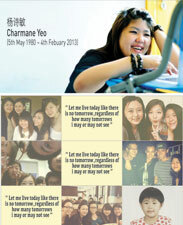 It could be framed up to remember the deceased and reminisce those times. 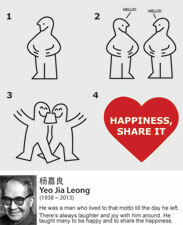 "The greatest happiness in life is to make another happy." Ikea’s instruction guide is simple and easy to understand. Same goes for the gesture of the quote above. A simple message from the deceased to share with everyone as a way of returning something to the society. People always want and try to win when they are alive; we care about what we gain and what we lose. Now that this man has passed away, as a family and friend, he is already a winner in our mind, he already won in his own life. Even though a person has passed away, the family value that he set and his excellent qualities will never die, they will be treated as a family treasure to hand down to future generations. This piece is more about his personality, he was a man of foresight, always made the right decision for the future, and he had his own point of view. This is one of the anniversary orbituary design series. 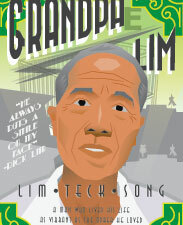 The character of this series is an old father who suffered senile dementia like most of the elderly do. 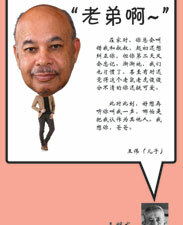 He went through a phase of mistaken identity, frequently called people’s names wrongly. In my design campaign, I tried to use his family members’ perspective to talk about those funny mistakes he made when he was home. On art direction, in order to get readers’ attention and let them understand the story easily, I showed their daily scenario visually. For example, the father liked to call his daughter his wife, so the visual shows how the daughter looked like in the father’s eyes. It’s more exaggerated. I learnt to overcome death when I learnt how to live and celebrate life. The idea is to change the perception of how we look at a person’s death; and instead, celebrate and bring light to those brief moments of love, laughter and joy that have made one’s life beautiful and complete. The collage of old photographs has been weaved together to signify the little but meaningful parts of the deceased’s life. The creation of this ad was made in hopes of bringing positivity and light-heartedness by focusing on one’s special attribute or quality; in this case - one’s smile. The idea is that if we could get friends and family, or even the public to pledge a smile, we are one step closer towards changing the general public’s perception in obituaries and death. An added touch is the ad’s interactive approach, allowing it to be deeply remembered by readers. 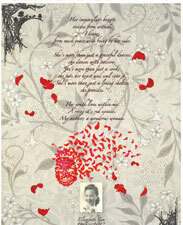 This obituary is influenced by the style of art deco -a much more modernised version. The entire layout is very neat and organised; everything in its place. Lines are clean and geometric, and are further stylised by thickness, style (dashed) and colour. This ensures the design does not turn out boring. Colours are bright but not overpowering - rather, they contrast one another well. Their pastel hues lend the design a whimsical, almost joyful vibe -which is the aim of my obituary... to trigger feelings of whim, of nostalgia, of fond remembrance - not sorrow and regret. I hope to put a smile on the viewer’s face and to make them feel that, hey, the good times have been lived, they’ve passed away; now it is time to move on. This obitcheery is dedicated to my grandmother, who raised 7 children all by herself when her husband suddenly passed away. 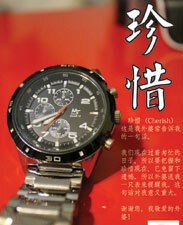 The theme for this obitcheery is to remind people that time will not stop for anyone even when we mourn. 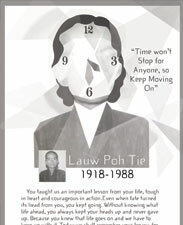 I created a chaotic shape blends with my grandmother’s face with the clock to show that even though my grandmother never knew what would happen to her life when her husband passed away, she kept moving on because she knew that she had responsibilities to carry in her life. By presenting this fact, I hope that those who mourn for their family and friends will happily cherish the deceased’s memories and legacies and keep moving on with their lives. Orbituary ads need to be infused with more fun and personality. I set a cheerful tone by using bold and cheerful colours in the background to represent the character. 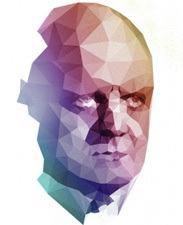 The personality of the person is represented by illustration in the picture, supported by details of characteristics based on the facial features. The style I chose to inspire me is the post-war style of Art Deco. It is bold and decorative, which was my direction. I’ve used patterns and Art Deco inspired buildings in Singapore, which is the backstory for the person I’ve made up - The Majestic opera building and Neo Tiew HDB flat that were torn down already. This person has lived a colourful life and this is his poster for his "opera show", his final performance. The impact the deceased has on their friends and relatives are not limited to when they were alive. Their legacy, life mottos and daily habits can continue to influence people around them even after their passing. The aim: to convey PASSING IT ON message by using visuals - using simple and basic elements in which people can easily comprehend its underlying message. Chosen element - light (More often than not we forget its existence till in darkness), water (a simple act can cause a ripple effect) and sound (music is the movement of sound that reaches the soul). By incorporating the deceased’s silhouette with these chosen elements, it will help remind their loved ones that their legacies are still felt today. I’ve based my obituary design on the Art Deco movement. My theme is a retro dance party because I wanted to change people’s fixed mindset in which they think orbituaries have to be sad, mournful and mundane. Why not a celebration instead? To portray how the fun never dies, Ms Tan will be the ’host’ and people are invited to celebrate her passing away into the new world. it’s a simple and straight forward design with minimal texts to highlight the event itself. This obitcheery design is inspired by Bauhaus typography. " Empty your mind, be formless, shapeless, like water" is used in my design because it is one of the most inspiring quotes by Bruce Lee as it teaches us to be flexible and adaptable. 2 visuals are used in my design; water and nunchaku. 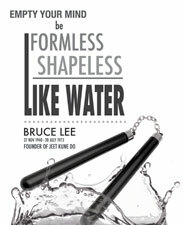 Water represents the quote aforementioned and the nunchaku represents Lee himself. Having the nunchaku dropped into the water signifies the loss of Bruce Lee. The objectives of my final outcome are to achieve a different look rather than a typical obituary design and to remember Bruce Lee not just by his appearance but his philosophies in life that inspires and motivates. 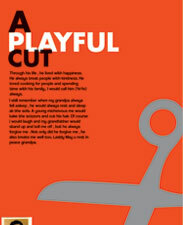 This orbituary design of a playful cut was influenced by the international typographic style: Swiss Design. As Swiss design could bring out what I wanted to share about what I did with my "Ye Ye" (grandfather), a special act that I’ve done when I was young. The story is whenever my grandfather fell asleep in the living room , I would have taken out the scissors and cut his old hair. He didn’t have much hair left , the young me thought that it was fun and funny but to the current me , it feels like a previous memory that me and my grandfather had shared. The rock hand sign has a lot of meanings, and so does it for the family. 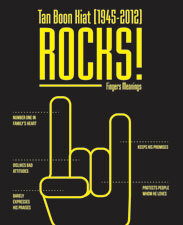 The dear one who has left was a cool person who rocked, and it is represented in each finger in the rock sign. He is number one in their hearts (index) and always kept his promises (pinky). He disliked bad attitudes (folded middle) and protected his loved ones (folded ring). He barely praised people but deep down he is really proud (parallel thumb). 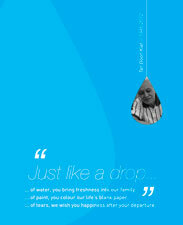 The idea is to create an analogy of a drop and the changes/memories the person left in the family. A drop of water, or a drop of paint, may not be a lot, but it brings a big difference that can be felt or seen, such as freshness and colour. This work is about a lady, she was an extremely kind and nice person. She would always find a way to help her neighbours and find ways to bond with them. The concept behind shows that she made friends easily and, even though she passed away, she still tries her best to make more friends. Asking the neighbour below if they would like to go for a coffee (In the Obituaries section). 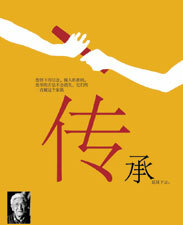 Giving her relatives and friends a peace of mind, since she will have friends everywhere she go, so they shall not worry. 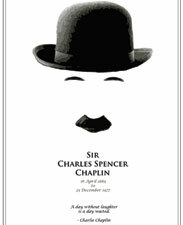 Charles Chaplin, better known as "Charlie" is a well-known comedian and an icon world-wide. His famous trademark would be his black hat, well-sculpted eyebrow, and the Hitler look-alike moustache. Incorporating these elements, a smiling face is formed. One of his quotes include, "A day without laughter is a day wasted. ", and I think it reflects him as a comedian and I hope that people can remember him as the person who brings laughter to the people. The main focus of this obitcheery is the old ice kachang machine. Visual elements used are pen and watercolour. 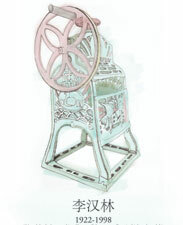 I chose old ice kachang machine because my grandfather was a hawker in his time to support the family. This obitcheery is inspired by the Art Noveau style. The choice of colours are more pastel, softer than the actual colour of the icekachang machine. I also painted the drawing digitally with watercolour to soften the tone. I went for a more subtle way of presenting the ice kachang machine and used white as a background to express pleasant flashbacks or memories. The "obituary" is inspired by IKEA’s furniture manual for self-assembly. IKEA’s corporate identity is being used to emphasise the "Cradle to Grave" concept. 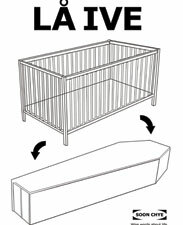 In this case, an IKEA crib is shown together with a coffin, both illustrated with the corporate identity of IKEA. The obituary itself looks like the front cover of IKEA’s instruction manuals, with the "wise words" of the deceased "instructing" and describing how life is just like putting together IKEA’s furniture. There is also word play involved. LA IVE is derived from the exaggerated pronounciation of "Life", thus providing the "furniture" with a Swedish-sounding name like all of IKEA’s furniture. 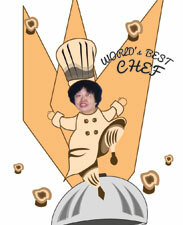 I did this obitcheery for one of the manga artists who created Doraemon, Fujimoto Hiroshi. Fujimoto was successful his job as a mangaka, and Doraemon was one of his biggest, successful mangas and also the most well-known one. There’s no way I would do Fujimoto’s obicheery without mentioning Doraemon. 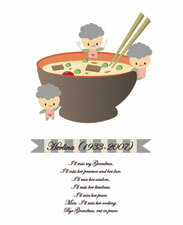 Thus, I placed part of the lyrics of Doraemon’s first theme song into my design. 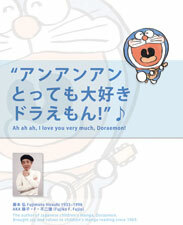 The lyrics can be translated to: "I love Doraemon very much". This is not only the lyrics, but also what children think of Doraemon. People love Doraemon, people love the person who created Doraemon. Although Fujimoto’s no longer with us, but his creation, Doraemon will still be one of the most significant and iconic mascots of the Japanese manga culture, and continue to bring joy to us. My Grandmother has always been an important figure in my life. The watch that she gave me as a present always reminds me of her teachings and valuable insights. Thus, I use the watch to bring out her impact on me and how it had changed me. 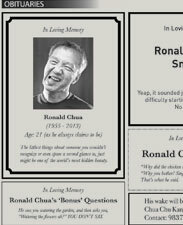 Obituaries are always giving the impression that death is a traumatic experience and that the deceased is gone forever, leaving behind only a sad obituary ad with a picture that is as sad and depressing — black and white, trapped in a small little box. Where’s the personality of the deceased when they were alive? Does it mean that when someone dies, their personality dies? The answer is of course NO. To highlight the belief that the deceased are going to a better place, where they can still be who they were in the hearts of the people dear to them, this campaign is created, with the theme, ’spirit that lived on’. 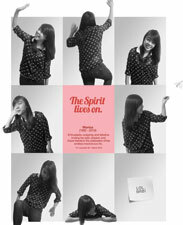 The series consists of 3 print ads, with each of them having different themes and personalities. The ’spirit that lived on’ is depicted by showing the deceased reaching out of the photo frames, as if they’re continuing life, trying to interact with their new friends who are also in the obituary page. Your smiling face is still in our mind; your spirit and dance bring us infinite strength and courage. I believe you gave this world your all. "If you enter this world knowing you are loved and you leave this world knowing the same, then everything that happens in between can be dealt with." My concept is about commemorating the deceased by sharing the achievements they have in their lives and how they carried no regrets with them. Although they may have moved on, what is important is the memories they have given their loved ones, and the happy times they have been through together. 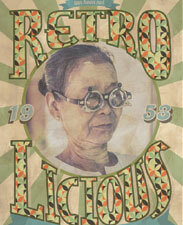 For my first ad, I chose an average lady, using her spectacles to show what she had seen and experienced throughout her life. For my second ad, I chose a simple tray cleaner from neighbourhood coffee shops. This layout shows his life, the life experiences he had, and that he’s sharing his joy with us. 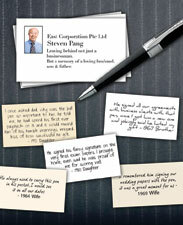 Lastly, my final ad is about a successful businessman who had passed on, leaving valuable memories for his loved ones. Inspired by the elaborated frames of the art nouveau period, I came up with this certificate design, commending one’s ability to live a good life for such a long period of time. It can also be seen as a ’last gift’ and recognition from the family to the departed loved one. 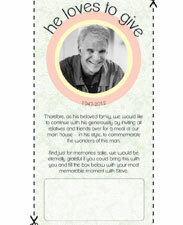 Using circles that is widely used in the Bauhaus movement, I came up with this coupon-style obituary, where friends and family can cut out the portion, fill up the given space with a memorable moment they had with the departed, and then pass it to the family members when they have a meal (instead of a wake) together, as a token of remembrance. This obituary print ad is for one of the famous knowledgeable people in the world who had sadly passed away. 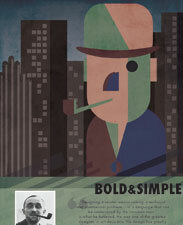 I used art deco terminology theme for this obituary print ad. I wanted to make it a little different by adding a bit of faded colour since this person is known to having all layouts in black and white. Using a texture behind gave this ad more life, giving a feel of remembrance and how he had lived his life so successfully. I have purposely used iconology in this ad to represent who he was since most of the younger generation don’t really know who he was. I would say I have done a satisfying job in making this ad relate to the theme and show his personality. This obituary print ad is for one of my own grandfathers who passed away last year. 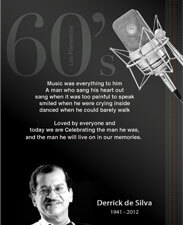 He was one of the greatest singers I personally knew and he was famous for his singing back in the 60’s. 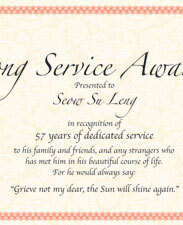 For this obituary ad, I got my inspiration from the art deco terminology theme. 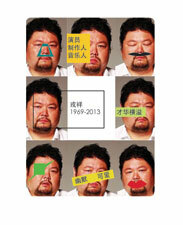 I do want to keep the respect for him through this ad, so I kept it simple yet decorative. Using black and white all over shows how he was a legend in our family. To grab the attention of the reader to spend a little time reading about him, I used an old mic which gives a feel of him being a singer. For the background, I have used a pattern similar to his costume back in those days, and I have played around with the opacity and gradient. At the end of the day, I want it to be simple yet unique to show that we love him and respect his legacy. My idea is based on quotes. A person is often remembered for the words/phrases they say. 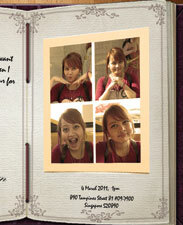 Therefore, the obituary that I designed is in a form of a diary. There is a quote that the deceased frequently said. When we read the phrase, we will immediately think about her and her words. The words she said can be both a learning experience for the living and also a form of message that she pass on to those that she had left behind. At the very bottom of the page, all the family members will leave their signatures. The idea behind my concept is to portray death as a ’holiday’ trip for my grandma. 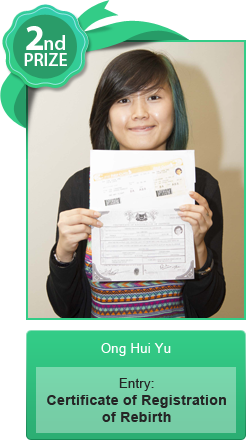 She had not travelled out of Singapore for a holiday since my grandpa passed away when I was still young. 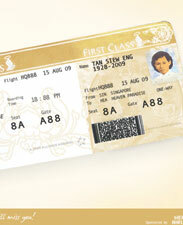 So I made use of this idea to design and create this ’one-way’ air ticket for her to heaven, to somewhere very beautiful. My air ticket resembles our world-class Singapore Airlines air ticket because my grandma deserved to be on the best flight for her holiday. People die. After they have experienced enthusiasm, happiness, motivation, and everything. We have been pushed for time, for work, for other people and even for ourselves. We always say, "Too many things to do, too many things to think, but no time to do." And we always seek for proper rest. It would be better if it were unrestricted, we hope. We celebrate. After they have gone through their lives, they can finally be on holiday forever. Letting them repose in peace is my key communication for this series of advertisements. 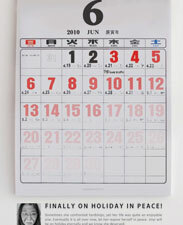 Fading calendar with red dates, clock without hands and infinite quantity of visa days are main visuals that convey the message, "she/he is on holiday eternally." 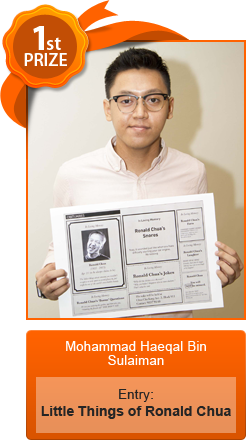 This obitcheery focuses mainly on the things he/she enjoyed while alive. I believe this is what makes all of us — what we love. Graphic encircles the loved one who had passed on, with things he/she did that still reminds us of the impact they had created in our lives. Being quirky and modernistic, this obitcheery design not only moves away from having a standard small portraiture of the deceased, it also provides a quick, holistic view of the deceased to the audience who reads this obitcheery, from head to toe and from inside out. This obitcherry is specially designed to be flippable. The rationale behind this is the curiosity towards the happy faces on the obitcheerys, as people wonder what’s the actual happy scenario. Flipping to the actual photo, the audience will find themselves at a page that depicts what the deceased is known to love when he/she was alive. In addition to that, it comes with a copy of a memorable headline and a light-hearted, description from his/her loved ones. This obicherry challenges the audience to remember the deceased through fond memories of him/her. This obitcherry is designed to hold the look of new media application. 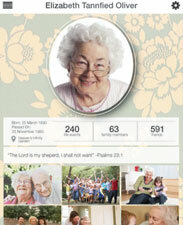 The audience is familiar with technology, therefore this new interface excites and brings obituaries to a new level. Remember a loved one in a totally different way. It still contains the usual information, but with a kick of something new. Looking closer, there is an icon that depicts the ’location’ your loved ones are currently at. This obitcherry also contains photos, a life summary through infographics, and a QR code that leads to an online experience. I believe that it would create an opportunity for each and every one to relook into the lives of their loved ones. The concept of this design is very simple. It gives a very light mood and shows a very subtle kind of humour as well. The fact that this man’s greatest achievement can be summarised so briefly holds a bit of humour, and there are no words to describe how he changed our lives, so all we can say is, "Thank you." 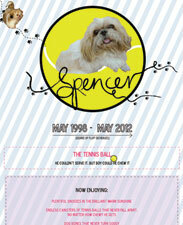 My obituary design is made for my best friend. 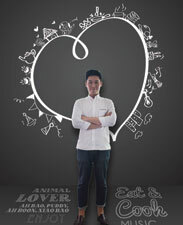 I feel a huge connection towards this competition because I wanted to dedicate my passion in design to the person I love. 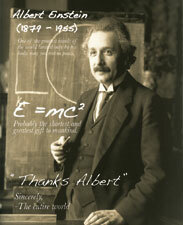 I designed it to the interest of my friend and I guess I portrayed what he would be doing now if he were still alive. 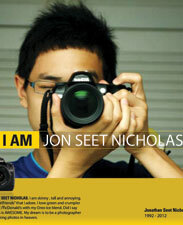 I chose "I AM" campaign from Nikon because i felt that the campaign showcases images and stories. So, I placed an image of my friend holding his favourite camera and told a story from that. His dream was to be a photographer, but fate didn’t make it come true. I hope from this design that maybe his dreams came true in heaven. 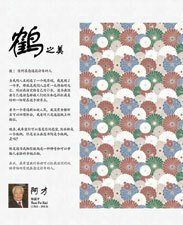 Mei from Hong Kong had a song called "Woman Flower", so this design consists of flowers and her photo. The colour of the picture is deep and very peaceful. She was one of the first female artistes to attain great achievements in the music and film industry. This obitcheery ad is trying to bring the audience to the art deco era, reminding us of the great works of Cassandre. To look back at the past, cheer and appreciate the designs at that time, because that is what brings us to our designing world these days. The obitcheery uses the characteristics of the art deco because that represents Cassandre, a very famous graphic designer. Also, it shows the clear intention of the obitcheery. There is a minimum of 10 obituary ads on each side of a full-page classified newspaper. Moreover, obituaries often seem to lack the deceased’s personality. Therefore, it is tough to identify a family member or a friend (touchwood) through this clutter. The only solution is to make the ad stand out using the deceased’s personality. Through the emphasis on the quotes he lived by, people who were close to the deceased will be drawn to the obitcheery. In addition, photos of the deceased might look daunting to some. 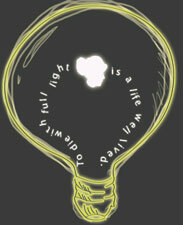 Therefore, a comic-like treatment is used to lighten up the visual. At the bottom of the photograph is the definition of the quote. This also gives people an understanding of the quotes from those who had passed on, and learn from their past stories or mistakes. A call to action is included at the bottom to end the obitcheery ad. 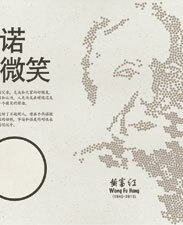 Rong Xiang was a famous Taiwan artist. When he died, he was just 43 years old, and his family was very distressed, but I want to deliver his humorous and positive side to people. Death is not always a bad thing; there can also be a kind of humour, a kind of spiritual inheritance. And we must learn to accept death, instead of refusing it. Cras at enim est, eu accumsan velit. Nulla turpis neque, pellentesque non ultrices id, placerat sit amet lacus. Cras pharetra faucibus tincidunt. Cras pulvinar tincidunt sapien vel molestie. Donec nunc nisl, adipiscing in ullamcorper nec, cursus sit amet velit. Quisque ultricies eleifend nibh, at hendrerit lectus pellentesque vitae. Vestibulum pretium, mauris vitae egestas varius, urna mi eleifend arcu, at imperdiet urna ligula nec sapien.
" + convert(rationale) + "